I wasn’t sure how to represent footsteps on the moon other than showing actual footsteps. This didn’t seem too exciting until I saw this quote from Neil deGrasse Tyson, “The atoms of our bodies are traceable to stars that manufactured them in their cores and exploded these enriched ingredients across our galaxy, billions of years ago. For this reason, we are biologically connected to every other living thing in the world. We are chemically connected to all molecules on Earth. And we are atomically connected to all atoms in the universe. We are not figuratively, but literally stardust.” So, I added the stars to the piece to give it a more whimsical quality and a human connection. There are seventeen stars representing the seventeen Apollo missions. 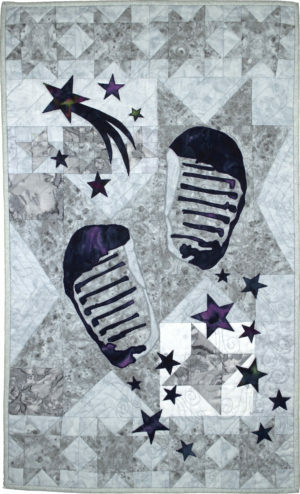 Raw-edge applique, machine piecing and quilting. Cotton fabric, batting, and thread.